Successfully Added Wotofo Sapor V2 25mm Rebuildable Tank Atomizer - Dual-Coil, Dual Adjustable Air Flow, 510 Thread, Durable Stainless Steel Body to your Shopping Cart. 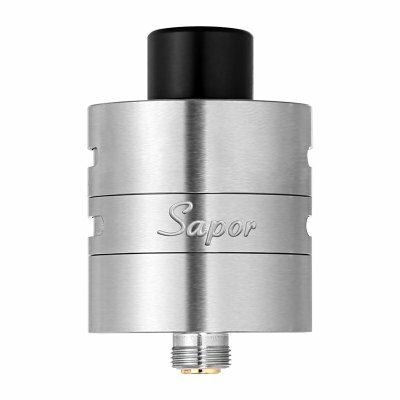 The Sapor V2 is a magnificent rebuildable tank atomizer (RTA) that features a beautiful dual-coil design. Manufactured by Wotofo, a well-known company in the vaping industry famous for its high-quality products – the Sapor V2 is a durable RTA that is sure to bring along a great vaping experience. Crafted out of durable stainless steel, this durable RTA features dual airflow control (AFC). With 5 airflow holes at the bottom and 4 at the top, the Wotofo Sapor V2 brings along plenty of possibilities for you to adjust your upcoming vaping experience to your exact personal liking. Along with its two coils, this RTA is guaranteed to bring along a satisfying taste and exceptionally large vapor clouds – allowing you to enjoy your next vape to the absolute most. This large 25mm rebuildable tank atomizer features a massive build deck that allows you to insert a substantial amount of cotton into your dual cores. Simply insert your coils and cotton, and drip on your favorite vapor e-liquid taste to enjoy a relaxing and tasteful vaping session. Perfect for the advanced vapers out there, this Wotofo RTA offers plenty of possibilities to upgrade the performance of your current vaper or electronic cigarette. Known to produce great taste while simultaneously creating large vapor clouds – the Sapor V2 truly allows you to take the most out of your vaper or E-cigarette the next time you enjoy a tasty vape. With its rebuildable design, this RTA is easy to operate and clean. By featuring a beautiful appearance and providing you with an unnatural user experience, the Sapor V2 is the perfect vaping accessory for all advanced vapors out there. Featuring a 25ml diameter and a 510 thread, the Wotofo Sapor V2 provides you with great control over your vaping and brings along plenty of possibilities for you to fully enhance your vaping experience. The Sapor V2 comes with a 12 months warranty, brought to you by the leader in electronic devices as well as wholesale electronic gadgets..
Arabic: - رذاذ خزان صماماته - Chinese Simplified: - rebuildable 坦克雾化器 - Czech: - opravitelný tank atomizér - Danish: - rebuildable tank forstøver - Dutch: - rebuildable tank verstuiver - French: - atomiseur tank reconstructible - German: - reparierten Tank Zerstäuber - Hebrew: - טנק rebuildable atomizer - Hindi: - rebuildable टैंक कणित्र - Italian: - atomizzatore del carro armato rebuildable - Japanese: - rebuildable タンクアトマイザー - Korean: - 넣어서 탱크 분무기 - Malay: - Kereta kebal rebuildable pengabut - Norwegian Bokmål: - rebuildable tank atomizer - Romanian: - atomizor rezervor Rebuildable - Russian: - тайтла танк атомайзеры - Spanish: - atomizador del tanque autos - Thai: - rebuildable ถังฉีดน้ำ - Turkish: - Rebuildable tank atomizer - Vietnamese: - rebuildable xe tăng phun.